Traditional Chinese Medicine (TCM) was originated in ancient China and has a history of over two thousand years. Influenced by ancient Chinese philosophy, culture, and science and technology, Chinese medicine uses the theory of Yin and Yang and the theory of Wu Xing to explain the mechanism of balancing the function of the body. While the direct meanings of yin and yang in Chinese are positive and brightness versus negative and darkness, Chinese philosophy uses yin and yang to represent a wider range of opposite forces that are complementary and contradictory that cannot exist without each other. Together, the yin and yang make up the life energy, called “Qi”. Qi is a type of energy that flows through the body through invisible sets of pathways called meridians. The theory of Yin and Yang is fundamental to the practice of TCM, where the most basic level of TCM treatment is to seek the balance of yin and yang in each person. 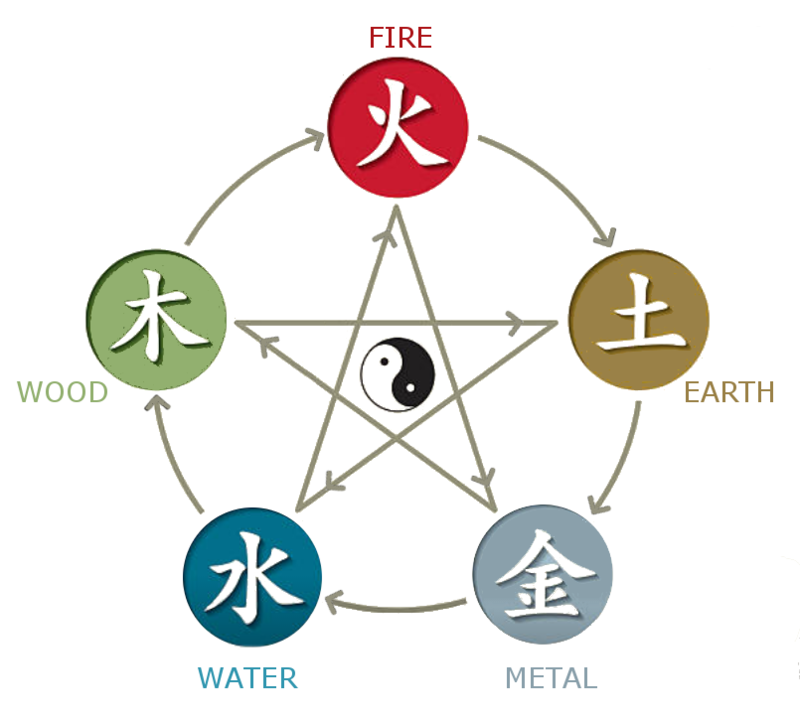 The theory of Wu Xing, the five elements (wood, fire, earth, metal and water) interprets the relationship and the constant movements and cycles between the physiology and pathology of the human body and the natural environment. The chart below outlines how the natural changes within the body and the environment affect your health. There are two types of internal organs: the zang (yin) organs, and fu (yang) organs. Zang organs include: the liver, heart, spleen, lung, and kidney. Fu organs include: the gallbladder, small intestine, stomach, large intestine and bladder. Linked to the theory of Wu Xing: the theory of Zang Fu explains the physiological function, pathological changes, and the mutual relationships of each organ (refer to chart under Theory of Wu Xing). Each organ has their own characteristics and functions; zang organs mainly store the vital substances (qi, blood and body fluids), while the fu organs perform the functions of receiving and digesting food, and transmitting and excreting waste. Linked to the theory of Yin and Yang: if there is an imbalance between the zang-fu organ system, signs and symptoms that correspond with the zang or fu system will be affected. Who can practise Traditional Chinese Medicine and TCM Acupuncture in Ontario? Perform a procedure on tissue below the dermis and below the surface of a mucous membrane for the purpose of performing acupuncture. Communicate a TCM diagnosis identifying a body system disorder as the cause of a person’s symptoms using TCM techniques. When visiting a TCM practitioner and/or acupuncturist, patients should expect the following procedures: after the patient gives consent to treatment, the practitioner will gather information of the patient's medical history, perform assessments and provide a diagnosis and treatment plan. Practitioners are required by law to explain the proposed treatments to their patients and to receive their patients’ informed consent for the proposed treatment. A patient has the right to receive sufficient information in order to make an informed decision on whether to accept treatment. Practitioners must ensure that their patients know, understand and consent to their assessments or treatments before any treatments begin. Consent must be informed by means of a meaningful dialogue between the practitioner and the patient. Consent may be obtained in writing or verbally, or it may be implied. However, the College strongly recommends written consent in the form of a signed and documented Consent to Treatment form. The TCM practitioner will gather information about the patient’s medical health history and family health history. In addition, the practitioner will record any medications currently taking, and any current symptoms by inquiring about the patient’s energy levels, sleep patterns, appetite, thirst, sweating, chills or fever, and any complaints of body pains, bowel habits, urine and menstruation. Listening and Smelling: The TCM practitioner will listen to the sound of the patients breathing, voice, and the quality of cough. The practitioner will also observe any breath odour. Touching: The TCM practitioner will perform a palpation of the body to discover body temperature, body moisture, pain, and strategic acupuncture points. Tongue Diagnosis: The TCM practitioner will make observations of the patient’s tongue, by examining the colour, coating, and shape. The practitioner will also observe the patient’s face, eyes, etc. Pulse Diagnosis: The TCM practitioner will take the patients pulse. This is an important aspect of the TCM practitioners in diagnosing illness, and in some cases, can indicate a problem or weakness before symptoms occur. Each wrist has three positions along the radial artery that represent each organ of the body. There are 28 different pulse characteristics pertaining to position, depth, rate, width, strength, quality, and rhythm. Based on the patient’s medical health history and assessment, the TCM practitioner will provide a TCM diagnosis on the imbalance in the body using the theories of yin and yang and the five elements. A detailed explanation of the diagnosis will be explained to the patient on how to remove what is excessive and/or replenish what is deficient from the body. The TCM practitioner may use a combination of herbal medicine and treatment modalities, such as acupuncture, moxibustion, cupping, gua sha, and tui na, as part of the treatment plan. 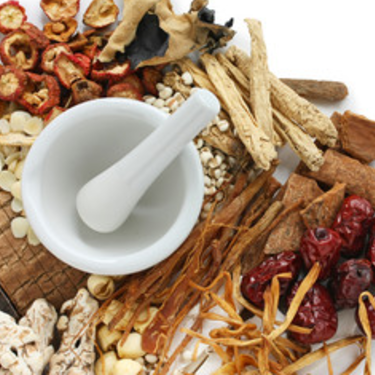 What types of treatments do Traditional Chinese Medicine Practitioners use? Traditional Chinese Medicine Practitioners use a number of treatment options based on the patient diagnosis. This may include a combination of herbal medicine and treatment modalities, such as acupuncture, moxibustion, cupping, gua sha, and tui na. Chinese herbal medicine is primarily plant based (using leaves, roots, stems, flowers and seeds), but some minerals and animal products are also used. These herbs are classified by its energy characteristics and taste property, where a combination of different herbs is used to balance the yin and yang energy patterns of the body. These formulas are packaged as powders, pastes, lotions or tablets, depending on the herb prescribed and its intended use. Acupuncture is the insertion of thin, metal needles to stimulate specific points of the body that reach meridians. These stimulation points are called acupuncture points or acupoints. 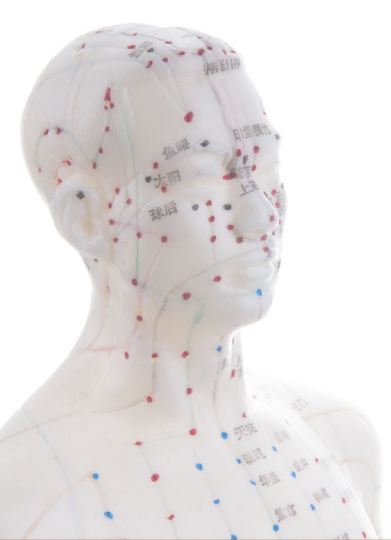 Traditional Chinese medicine holds that there are 365 commonly used acupuncture points on 20 meridians on the human body. Typically, it takes 15 to 30 minutes of manipulating the needles in these acupuncture points and 30 to 60 minutes of retaining the needles. By doing so, it regulates the flow of qi throughout the body and restore health to the mind and body, thus balancing the yin and yang. The insertions of needles are manipulated either by the hand or by electrical stimulation, called electroacupuncture. 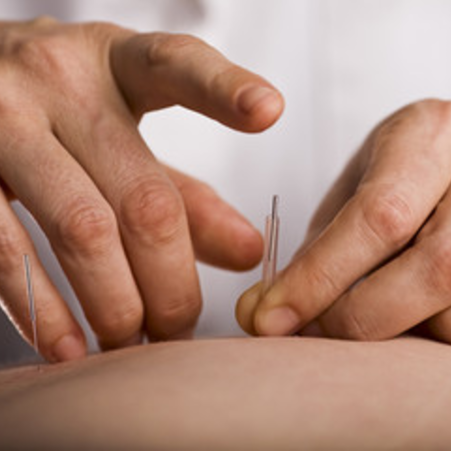 Needles inserted during an acupuncture treatment should be painless. Every patient experience is different; patients may experience bruising, bleeding, needle site pain and sensation, or needle fainting. However, these symptoms may be expected (minimal bleeding) and desired (tingle, tight sensation - "de qi response"). Patients should inform the practitioner if any discomfort arises. Is dry needling the same as TCM acupuncture? Dry needling is a technique used by Western practitioners such as physiotherapists, chiropractors, and occupational therapists etc. based on strictly body anatomy in opposed to TCM principals. Thin metal needles are inserted in specific muscle trigger points to release tension and pain. Dry needling does not apply any TCM principals nor diagnosis. Hence, dry needling practitioners are not necessarily receiving the same level of training as set out by the standards of our College. In other words, those who practise dry needling might not meet the requirements to use the title of "Registered Acupuncturist" or "Registered Traditional Chinese Medicine Practitioner" in the province of Ontario. Moxibustion is a form of heat therapy in which mugwort (a commonly used herb) is burned on (direct moxibustion) or near the skin (indirect moxibustion). The purpose of moxibustion is to heat acupuncture points in order to stimulate the flow of qi and strengthen the blood. There are two types of direct moxibustion: scarring and non-scarring. In the procedure of scarring moxibustion, the moxa is placed on an acupuncture point, burned and remains on the skin until it burns out completely. In the procedure of non-scarring moxibustion, the moxa is placed on an acupuncture point, burned, but extinguished or removed before it burns the skin. There are several forms of indirect moxibustion. One method is to light one end of a moxa stick and hold it close to the acupuncture point for a few minutes until the area turns red. Another method uses both acupuncture needles and moxa. A needle is inserted into an acupuncture point and retained. The tip of the needle is then wrapped in moxa and burned, generating heat to the acupuncture point and its surrounding area. The moxa is then extinguished and the needle is removed. The risks of heat therapy include burns, blisters, scarring and allergies. It is important for practitioners to be aware of the patients’ tolerance to heat. In the case of direct moxibustion, patients should experience a pleasant heating sensation deep into the skin. However, if the patient experiences strong pain, blistering and scarring, it may indicate that the moxa is left in place for too long. Therefore, indirect moxibustion is growing in popularity because there is a much lower risk of pain or burning. Cupping is a form of therapy that involves the suction of the skin and the surface muscle layer to stretch and be drawn into a cup. Cupping is used to encourage the blood flow of the body and treat conditions such as acute or chronic pains, respiratory problems and musculoskeletal problems. There are two methods of cupping: dry and wet. Each method includes different types of cupping. The two most common types of dry cupping are fire cupping and suction cupping. In the procedure of fire cupping, the inside of a glass cup is heated with fire, then placed onto the skin. As the air inside the cup cools, a vacuum is created causing the skin and muscle layer to rise and redden into the cup. In the procedure of suction cupping, a plastic or silicone cup, with valves at the top that attach to hand pumps, are placed on the skin then pumped to create suction by removing the air. The cups in both methods are to be left on the patient’s skin for 2 to 10 minutes. In the procedure of wet cupping, the skin is punctured by sterile needles before either the fire cups or suction cups are placed on the skin. This technique draws out the blood, thus removing harmful substances and toxins from the body. The cups are to be left on the patient’s skin for 2 to 10 minutes. After the cups are removed from the session, temporary red marks might show on the patient’s skin. These marks might remain on the skin for up to 10 days. These marks are a result of bruising and minor bleeding from broken capillary blood vessels. As with any heat therapy, there may be a chance of burning and scarring. Further, wet cupping carries a risk of exposure to and transfer of infections and bloodborne diseases, if needles are not properly sanitized. Gua sha is a technique in which a smooth-edged tool, such as Chinese soup spoon or pieces of honed jade, is pressed and stroked on a lubricated area of the body until a mark appears. Press-stroking is to be performed sequentially - line by line and in one direction - until the entire area is completed. When done correctly, Gua Sha should not be painful. The mark is a result of bruising and broken capillary blood vessels (sha). Raising sha removes abnormal qi and blood stagnation, and reduces inflammation; therefore, it provides immune protection, and improves the circulation of the body. According to Western medicine, it functions on: the nervous system to enhance human defense mechanism, and the circulative system which speeds up the circulation of blood and lymph to enhance metabolism. Tui Na is a type of therapy based on TCM theories of Zang-Fu organs and meridians, but it also combines the anatomy and pathological diagnosis from Western medicine. Like acupuncture, tui na involves the stimulation of specific points of the body that reach meridians. The main difference is that acupuncture uses needling techniques, whereas tui na uses Chinese massage and manipulation techniques. Some common techniques include: gliding, kneading, rolling, pressing, pulling, chopping, and vibrating. Each session lasts between 30 to 60 minutes, depending on the patient’s necessity. Tui na helps promote the blood circulation of the body, and enhances the qi blood supply. Tui na is used to treat a variety of pain, musculoskeletal syndromes, and digestive, respiratory and reproductive system disorders. Some common contraindications include: skin infection or epidemic disease.